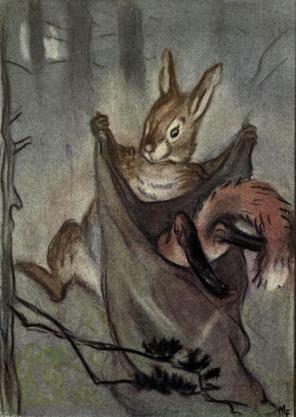 “Then Fox untied the bag, and let Rabbit out and got into the bag himself.” Illustration by Marcia Lane Foster from Canadian Fairy Tales by Cyrus MacMillan, published 1922. Read North American folk tales from the U.S and Canada by Carl Sandburg, Charles Skinner, Zitkala-Ša and others. View full list of North American folk tales. About: North American folklore includes a variety of stories, regions and authors; it can apply to any folk tale or fairy tale from the U.S or Canada, and each collection of stories for children has its own unique characteristics and content. Many of the stories were collected by their authors after they either grew up in the culture, studied it, or lived among the people who told them the tales. Author Charles Skinner wrote a collection known as Myths and Legends of Our Own Land, with each volume representing a certain region of the United States. The volumes include peculiar stories for the South, the Great Lakes areas, and beyond. Poet Carl Sandburg also contributed to North American folklore with his book Rootabaga Stories, a collection of stories for a fictional Midwest. The Native American culture has contributed significantly to North American folklore, both in the United States and Canada. Professor Cyrus MacMillan traveled Canada seeking tales for his collection Canadian Fairy Tales from First Nation tribes. Meanwhile, Sioux writer Zitkala-Ša wrote her culture’s myths and legends in the collection Old Indian Legends, because she saw a duty to preserve her heritage. The Eskimo people’s stories live on A Treasury of Eskimo Tales, authored by Clara Kern Bayliss, who shared not only a portrait of life for the natives, but also a look at their stories. Finally, folklorist Andrew Lang, who authored collections of fairy tales from around the world, collected several Native American tales in his books as well. The world of North American folklore has given us tales from not only the 50 states, but also Canada and the continent’s assorted tribes as well. Each story is a reflection of the culture, values and beliefs of the region from which it came.